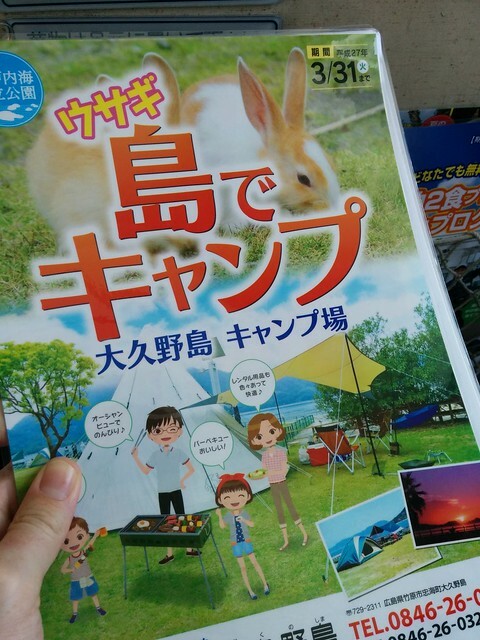 If you haven’t already heard, one of Japans smaller islands in the Seto inland sea (between Shikoku and Honshu islands) is home to a huge population of rabbits. It’s a bunny lovers paradise as the picturesque scenery and nature trails are covered in the hoppy little things. Recently it’s become a bit of a tourist attraction, and with good reason. 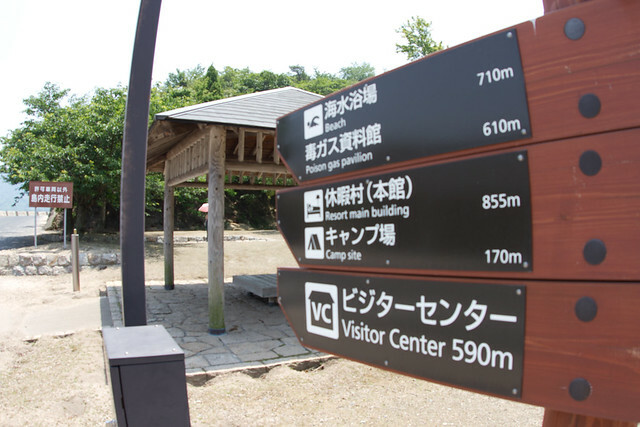 The island itself is actually a resort with a gorgeous beach, hiking trails with great views and camping facilities, and it’s easy to get to if you know how! Below is our video from our trip, and under that instructions on how we got there. 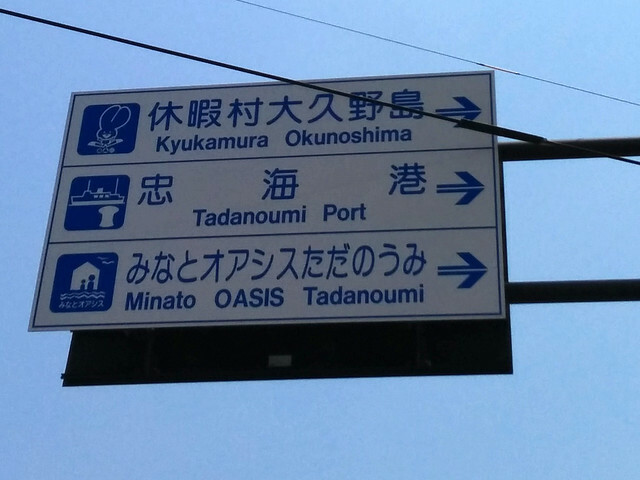 If you have a a JR train pass, there are a few routes you can take to “Bunny Island”, but they all end the same way – you want to be heading for Tadanoumi. If you’re paying for the trip, then the cheapest fare (at the moment) is 1,340yen each way (the Shinkansen route will cost you over 4,000). Once you get to Tadanoumi station, you might want to pop into Family Mart to grab some snacks as there isn’t really anywhere to eat on the island apart from the hotel (which ain’t cheap). You can also buy little bags of rabbit pellets here if you want to stock up before heading over. Once you’re ready, walk the opposite direction to Family Mart and you’ll soon see a big reassuring sign to know you’re in the right place. A return trip as a foot passenger on the ferry will cost you 620yen (at time of writing) and tickets can be bought from a vending machine if there isn’t a person behind the desk. How often do boats run to Okunishima? About every half hour, the picture below has the current timetable, and trains coincide pretty well with the ferry. 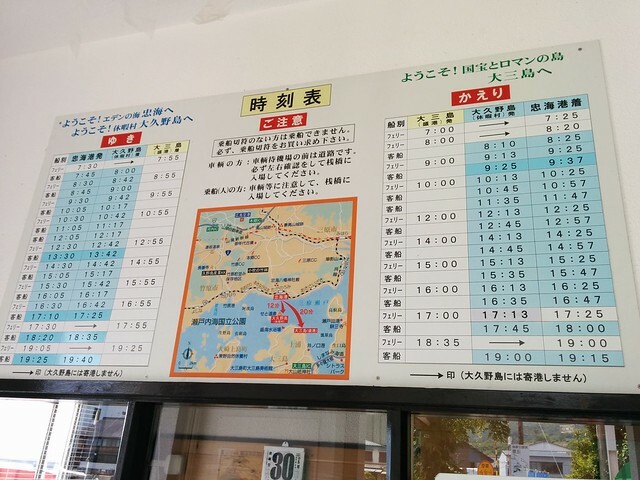 The boat actually stops at Okunoshima on the way to one of the other islands, so be sure to check the correct column! 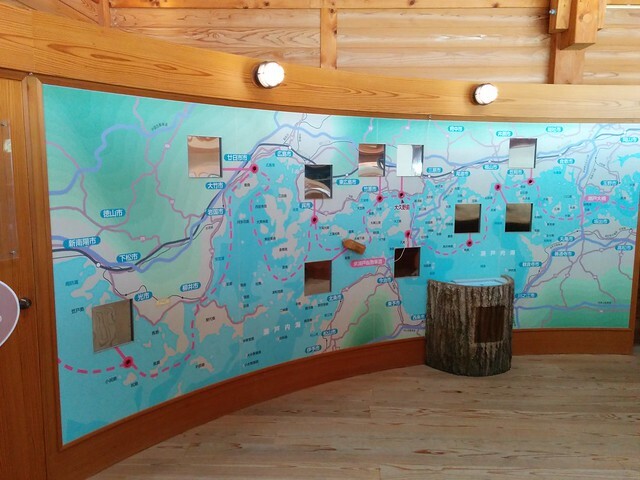 The section on the left is leaving Tadanoumi, with Okunoshima being the middle column. The right hand section reads ‘kaeri’ which means return, again, Okunoshima is the middle column, and the right most column is the time it will get back to Tadanoumi. We worked it out so leaving Hiroshima at around 9:30 got us to the island for lunch time, and we left around 4:30 which gave us four hours island time, and back in Hiroshima for the evening. Given the heat this was plenty of time to have a good walk around and give the rabbits plenty of attention. Also worth a mention is the visitors centre, which is located a few hundred metres from the ferry port, and near the ‘chemical gas chamber’ museum. Don’t worry, this isn’t for the oh-so-cute-fluffy-snuggly-bunnies, but a remnant of WW2 that supposedly housed our buck teethed friends before releasing them all upon its decommissioning (I’ve no idea if this is true, but it’s the most commonly believed reason for the rabbits being there). 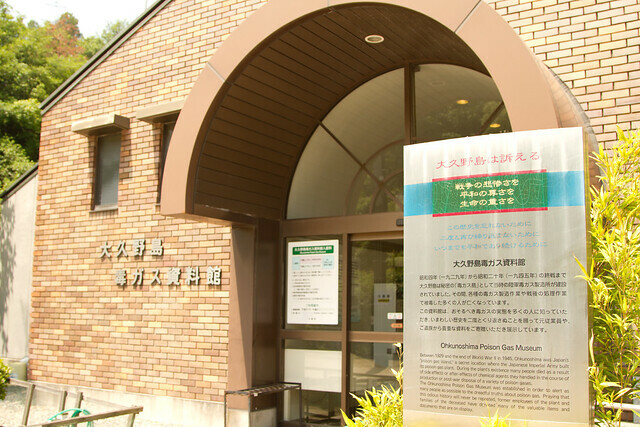 We didn’t go in the museum, but the visitor centre has a few cool hands on exhibits about nature, great photos of the island through the seasons and interactive displays explaining more about the group of islands that Okunoshima is a part of. 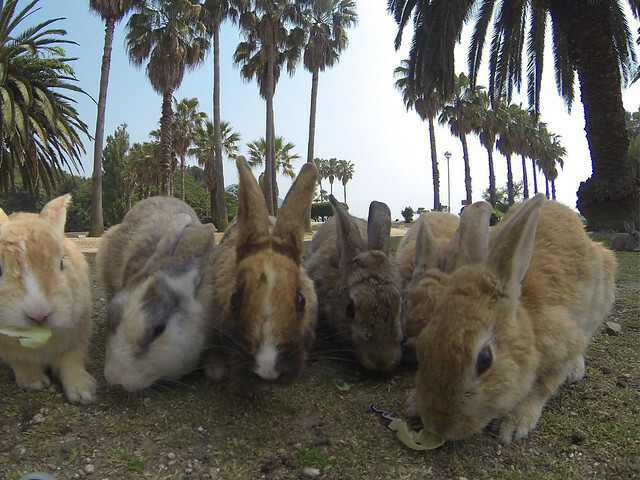 If you’re planning a trip to Okunoshima let us know in the comments, and if you have any questions ask away. How awesome. “Nowhere to eat on the island”! Hello!! Rabbits everywhere. All you need is a pastry top and dinner’s practically made. When would be a good time to travel there? I am intending to travel during nov or dec. Sorry for the late reply! Was having trouble with WP and Disqus playing nice. Ic. Thanks. I was worried that the rabbits would be hiding in the cold December. Hello … im intending to go there .. but how do i get there from Osaka ?